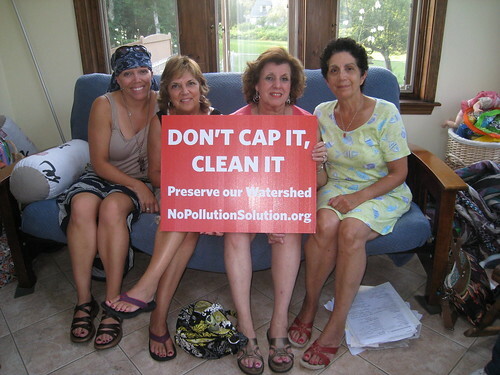 SouthCoast Alliance for a Cleaner tomorrow advocates for "No Pollution Solution"
Massachusetts is home to nearly 500 former landfills and dumps. Much like the Cecil Smith dump in Dartmouth- many of these landfills have been around since the 50’s are the flashpoint for real conversation about clean water. The Cecil Smith Dump was active from around 1953 until the 1970s- and no one really knows entirely what has been dumped there. Brockton-based Boston Environmental plans to cap the dormant dump by trucking 66,000 loads of soil filled with contaminants such as harbor dredgings and debris from construction projects, creating a 65-foot high mound with a five-acre plateau on top. The proposal comes after 40 years of court orders, lawsuits by the town and more than a dozen health complaints against the property. In response to a proposal to cap the landfill with 1.7 million tons of contaminated soil- residents banded together to form South Coast Alliance for a Cleaner Tomorrow to advocate for a no pollution solution. Neighbors have stepped up to stop this dirty plan, get testing to understand what is in the dump and move forward with options from there. The kicker here though is that the dump is surrounded by wetlands on three sides as well as residential private wells. It also lies in Dartmouth’s Aquifer Zone III. There are 13 Westport and Dartmouth community/town wells that lie within a 4 mile radius of the dump.